The other week I was having a conversation with a friend of mine about her breakfast. She was not getting full off of her smoothies and cooking eggs every morning with a 15 month old child was kind of out the question for her. So it got me to thinking about what could be made ahead to grab and go on a hectic morning to help encourage serial breakfast skippers from missing their first meal of the day. I mean there is granola, pre-packaged homemade oatmeal, hard boiled eggs, protein shakes and the list goes on but sometimes these items don’t hit the spot. So I figured I would take a crack at making a muffin. Now before I dive in here I feel like I need to share my opinion of muffins in general. I personally feel that muffins are just miniature cakes that people forgot to put icing on because the icing would well make it a cupcake. Sure yes there are healthy muffins out there but I am talking about the ones you are buying at Starbucks and Tim Hortons and basically any other prepared muffin, they aren’t great for you. So anyways I decided I would try and make a gluten free, refined sugar free, and oil free muffin. The first one turned out alright but I didn’t find it to be sweet or moist enough, luckily with just a couple tweaks I was able to find something that worked, was delicious and good for you. In a large mixing bowl, mix all wet ingredients together until smooth. In a separate bowl combine dry ingredients until combined, and then mix dry ingredients into the large mixing bowl with wet ingredients. Stir until well combined, about 2 minutes with an electric mixer. Line muffin tin with muffin liners. Fill muffin cups up about 3/4th of the way and pop them into the oven. They will cook for 25-30 minutes. Remove when a toothpick can be inserted into the middle and comes out clean. 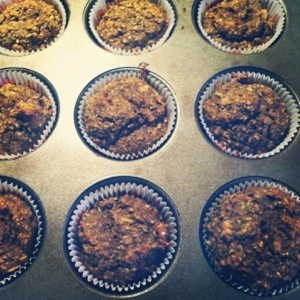 I hope you enjoy these muffins and they help to make your breakfasts and snacks a bit easier. Pair them up with some protein and vola! Happy Friday! I hope everyone enjoys the heat, and the weekend! This entry was posted in Food, General and tagged breakfast, breakfast muffins, chia seeds, gluten free, Muffin, oats, pumpkin seeds, refined sugar free, Sweet potato by healingginger. Bookmark the permalink. These muffins are DELICIOUS! I had one this morning, and it definitely helped fill the void that i needed without feeling like i ate an entire cake for breakfast!